Following early challenges, the field of plant-based recombinant protein production has now introduced commercial products into the market. Many biopharmaceutical companies are interested in producing biologics in plants, but may feel more comfortable with familiar bacterial, yeast, or mammalian expression systems. In this article, we address key technical, regulatory, and economic considerations unique to plant-based biomanufacturing, using as an illustrative example our successful program to commercialize recombinant human lactoferrin (rh-lactoferrin) expressed in rice. A typical process flow overview for rh-lactoferrin (Figure 1) shows that the steps are analogous to those encountered in any typical biomanufacturing program. The details of expression and the initial impurity profile are unique to plant manufacturing, but eminently manageable. Figure 1. An overview of the process flow for rh-lactoferrin. 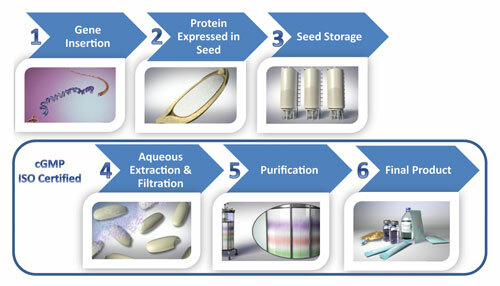 The utility of different plant-based biomanufacturing technologies depends on the end goals for the protein product, so it is critical to match available platforms (Table) to product-commercialization goals. At the most basic level, the macromolecular structure of the target protein product (globular, peptide, monoclonal antibody, multi-subunit protein, fusion protein, enzyme, etc.) must be compatible with the expression system. Specific kinds of eukaryotic post-translational modifications—such as glycosylation—must also be considered. Target yield is important in designing a protein expression project. Our goal for rh-lactoferrin was to commercialize it for multiple applications, including therapeutic development for antibiotic-associated diarrhea, chemotherapy-induced diarrhea, bowel and liver disease, and osteoporosis. Summary of plant expression systems and recombinant protein products on the market or in active development. Other products in our R&D pipeline are similarly versatile, and thus our needs call for a system that can express a variety of proteins at consistently high expression levels (Figure 2A) and that can yield many metric tons per year. For us, expression in rice meets these specific requirements, whereas products needed on a much smaller scale (e.g., orphan drugs) might be adequately served by other platforms. Figure 2. (A) High-level expression of multiple recombinant proteins and peptides in transgenic rice seed. The typical lower limit for commercial viability is 1 g target product per kg grain flour. (B) Stable expression of rh-lactoferrin in transgenic rice grain over multiple generations (R2 through R10). Another consideration for some therapeutic programs is the intended route of administration. Therapeutic rh-lactoferrin is administered orally in some applications and by injection in others. Therefore, a background organism with an attractive safety profile and one that allows easy purification from host proteins was desirable. 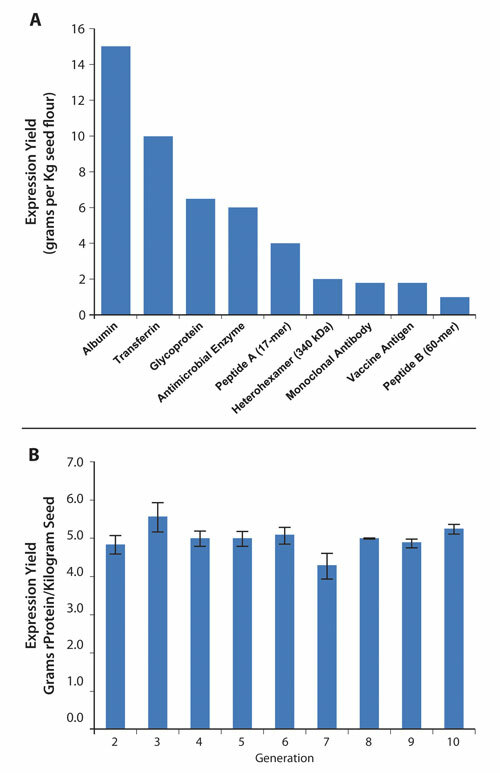 For proteins delivered parenterally (e.g., recombinant human albumin, glucocerebrosidase, or vaccines), the ability to express these in a background organism that does not harbor animal contaminants or human pathogens would give them a competitive safety advantage over product purified from human serum or avian and mammalian expression systems. Biopharmaceutical manufacturers already conversant with standard FDA, cGMP, ISO 9001, and EMA quality control and regulatory frameworks may hesitate to also place themselves under the oversight of the U.S. Department of Agriculture (USDA). They may also wonder if a plant-based biologic could be subject to new hurdles within the drug approval process. With respect to permitting for field production, the USDA in partnership with plant-system companies has developed operating procedures that allow for large-scale commercial production of plant-made pharmaceuticals while ensuring control of the regulated article. USDA permits are required for field production, importation, and transportation of viable material. Optimization of closed production systems, which are designed to prevent gene flow and physical commingling, have further facilitated the regulatory process by employing self-pollinating plants as the host organism and locating field production away from similar crops. USDA also offers a quality recognition system for field production activities called Biotechnology Quality Management System (BQMS). This system is similar to ISO9001 certification but specific for plant biotechnology operations. A history of safety in these activities has been proven, and biopharmaceutical companies can capitalize on the experience and expertise of their platform technology partner in designing and implementing manufacturing and regulatory protocols. The drug regulation question is noteworthy in the context of the FDA’s recent clearance of the first plant-made pharmaceutical product, Elelyso™ (taliglucerase alfa). This industry milestone by Protalix demonstrates that plant-manufactured protein therapeutics can successfully be taken through the drug approval process by channels familiar to biologics manufacturers. The technical challenges of producing recombinant proteins in plants are essentially similar to those of other expression systems. Any development program will follow the basic steps of transformation, expression testing, and expansion of clones that demonstrate high expression levels over multiple generations (Figure 2B). At this stage, master and working seed banks are created, analogous to the master and working freezer stocks of a cultured cell line. Biomass production (plant growth and harvest) occurs according to an agricultural process defined by the needs of the host plant. As in standard biomanufacturing, the development of an extraction and purification process is worked out empirically. Bulk biomass-processing steps such as cleaning, milling, extraction, and separation of extract are performed before chromatography, product formulation, packaging, and QC analysis. While the contaminants that must be removed are specific to the plant species used, this is similar to removal of background contaminants specific to expression systems like E. coli or CHO cells. Scaleup is generally dictated by protein expression level in the seed (or biomass) and by target batch size. For rh-lactoferrin, we have progressed from a bench-scale of several grams of protein product to clinical-scale of approximately 4 kg per batch. For Phase III clinical and early commercial material we will use a single commercial process train build-out for an approximately 200 kg batch size. Completion of the second process train and an increased production schedule will bring us up to commercial metric-ton quantities. The affordability and cost-effectiveness of a biologic therapy is increasingly important for patients and payors. We are developing rh-lactoferrin as the active ingredient in VEN100 for the treatment of antibiotic-associated diarrhea (AAD). This therapy requires approximately 30 g of recombinant protein over the treatment period, and in Phase II studies has been shown to reduce the incidence of AAD by 52%. Because AAD-associated healthcare costs are estimated at $1,500 per high-risk patient, VEN100 has the potential to save half of those costs on average and therefore could be considered cost-effective if priced at less than $750 per patient. Assuming a target cost-of-goods-sold of less than 15% of the product sales price, the cost to biomanufacture rh-lactoferrin must be less than $112.50 or about $3.75 per gram, a target cost-of-goods Ventria has comfortably achieved. Assuming 50% market penetration of a target market of 2.8 million U.S. prescriptions annually, 42 metric tons of recombinant protein would be required to satisfy U.S. demand. Recombinant protein production at this low cost per gram and exceedingly high annual output is only practical in a plant-based biomanufacturing system; for rh-lactoferrin, requiring an estimated capital investment of only about $50 million. The economics are driven by high product expression yield; low proportional cost of biomass production using sunlight and soil as raw materials; supply security derived from the ability to store unprocessed seed long-term without loss of product quality; and resulting high utilization of processing facilities. Amanda Broz, Ph.D., is a plant biotechnology research scientist, Ning Huang, Ph.D., is vp of R&D, and Greg Unruh (gunruh@ventria.com) is vp of manufacturing at Ventria Bioscience.